How do you update the home of time? 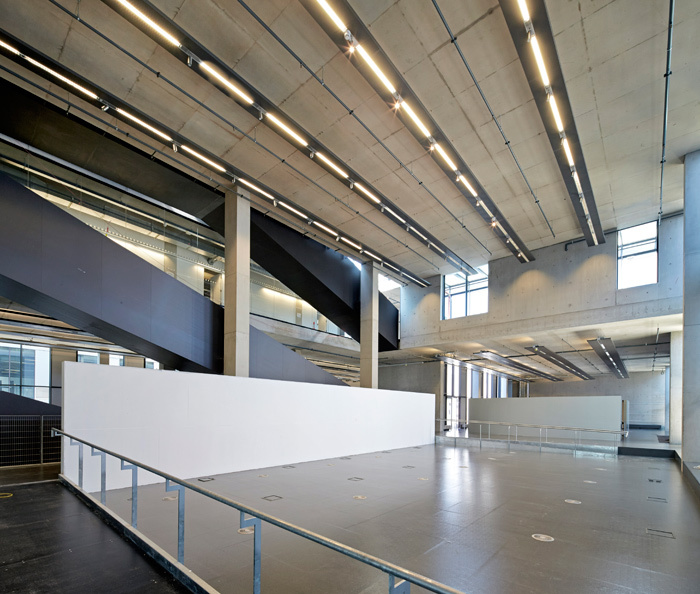 Architecture students at the University of Greenwich will take possession of a brand new building this term. Dublin-based practice Heneghan Peng has negotiated the area's historic fabric to produce an unobtrusive, elegant solution, with high-tech roof gardens and a 'crit pit'. London presents most architects with the problem of a dense, historic urban grain, and this is nowhere better exemplified that in the Royal (as of 2012) Borough of Greenwich. 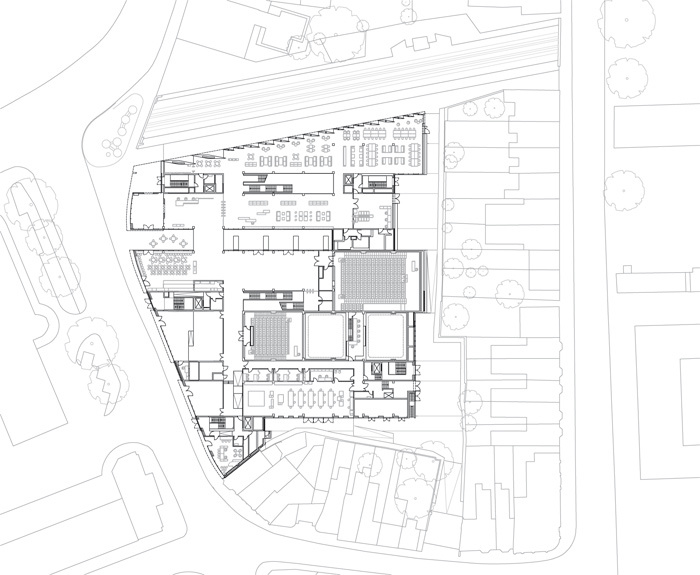 On its busy corner site, the new building for the University of Greenwich, located in the heart of the old town centre, must direct the behaviour of its witting and unwitting users, as well as behave itself formally within an historic fabric. 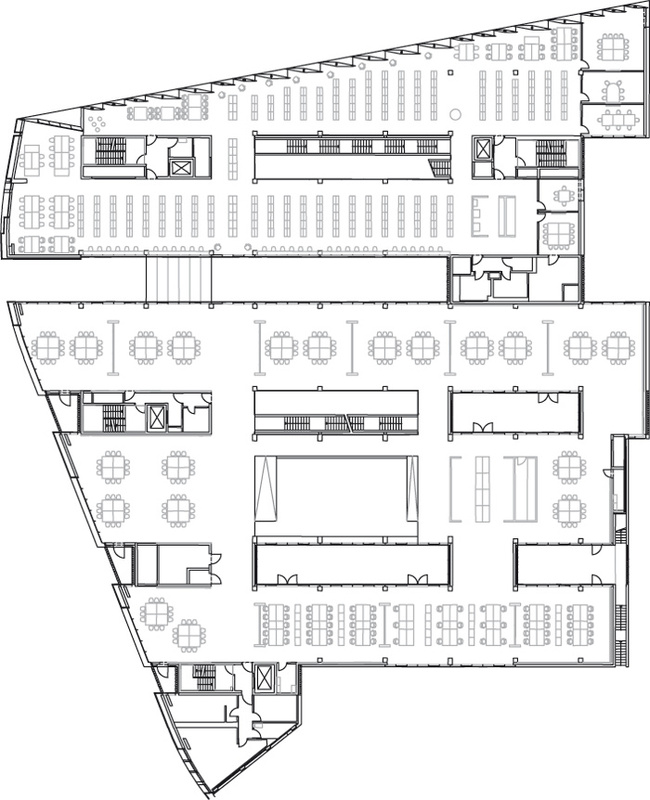 At the same time, if the spaces we occupy in our youth have a formative influence on us, then surely the design of a new, forward-looking school of architecture must give an architect the chance to empathise in a special way with their client -- fulfilling a dream to radically rethink the very space where their metier is studied. This was the opportunity presented to Dublin-based practice Heneghan Peng (HPARC), in Greenwich: a new campus library serving the university at large, and a new home for its reconfigured School of Architecture, Design and Construction, directed by dean of school, Professor Neil Spiller. Spiller joined the University of Greenwich just under five years ago in September 2010 -- after Heneghan Peng's commission and design, but prior to the details of the interior logic -- therefore walking headlong halfway into a major building project and essentially a reconfiguration of his department. In a recent interview, Spiller cites quantum computing, game theory and algae dynamics among the technologies in which future architects should be conversant. His vision for the operation of the school involves ramping up its ambition and increasing its presence in the pantheon of British and international hubs of scientific and technological innovation. The new building by Heneghan Peng, therefore, has to balance between radical change to the academy and respect for the context in which the building actually sits. The new campus building represents something of a departure from the norm for the 15-year-old office of Heneghan Peng, whose projects often demonstrate the prevalence of a highly geometrical sensibility in tune with the landscape. In fact, all its other projects are at least suggestive of grand tectonics. Consider Heneghan Peng's Stirling Prizenominated engagement with the Giant's Causeway, itself presenting a dramatically geometric terrain with its bizarre, hexagonal basalt columns. Emerging triumphantly from the project's on-again, off-again history, HPARC's competition winning visitor centre embeds itself in the rise and fall of the natural surrounds, its simple box-like perimeter articulated rhythmically, echoing the vertical stone blocks which define the Causeway as Ireland's biggest tourist attraction. Other works demonstrate an entrenched concern with pure geometry and a deep engagement with landscape. Current projects include: the Grand Egyptian Museum at Giza, Egypt, where the formal references are obvious, and a Palestinian Museum in Birzeit, which borrows from patterns of land cultivation and terraced farming to suggest a neutral, healing territory in which local histories may be considered. Rather than natural tectonics or agricultural patterns, at Greenwich it is that dense urban grain which informs the main concept -- the terraced housing, cross streets and surrounding buildings have been drawn through the site to form a striaited plan of wide and narrow 'fingers'. Five blocks, approximately spanning 12m each, constitute the 'wide fingers' of the actual building, between three and five storeys high. These alternate with narrower 'courtyard' spaces, allowing for porosity at the ground level, which will accommodate shops and publicly accessible facilities. Retail and commercial operators will benefit from the busy street frontage, especially as the college will bring significant new levels of footfall. Pedestrian access runs along the south-eastern edge of the site, as busy Church Street joins the east-west axis of Stockwell and Silver streets. The volume and massing for the new Greenwich campus was also dictated by the site, HPARC's eponymous co-founder Roisin Heneghan explains. With the heritage designation covering all of Maritime Greenwich, no single mass could jut disruptively from the existing roof line, therefore the building height was constrained at the front by its commercial and institutional neighbours, and at the interior or rear edge of the site, by the row of terraced houses, which back on to the site and are overlooked by the university's landscaped roof gardens. Abundant planting, it is hoped, will soften the building's rear edge sufficiently, so that the inhabitants of the little Victorian terraces may learn to love the verdant gardens that step down to face their backyards. Indeed, the roof gardens will be one of the university's most visible and unique assets. 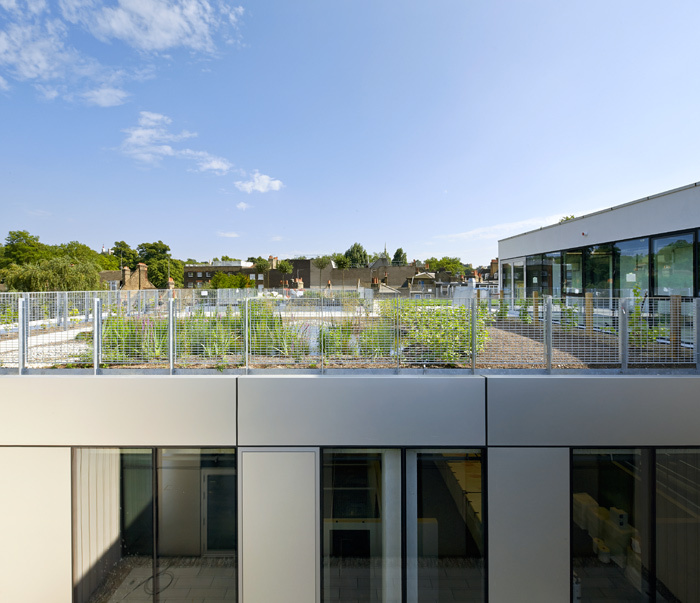 A diverse range of climactic conditions and experimental habitats, including separate aquatic areas (into which a family of ducks has already settled, long before the students) make the roof garden a valuable 'live' learning environment for landscape students. This department will be joined, at this site, to architecture for the first time. The roof supports a depth of 600mm of either soil or water, for variable habitat and landscape creation, and is divided into modules across the wide and narrow 'fingers' of the building. As useful and beautiful as this is, perhaps the most exciting part of the roof is an algaeponics unit, developed together with TED-talker Dr Rachel Armstrong. Former co-director of Greenwich's AVATAR (Advanced Virtual and Technological Architectural Research) programme and now professor of Experimental Architecture at Newcastle University, Armstrong is a proponent of 'Living Architecture', an approach which suggests that buildings might appropriate some of the characteristics of living, biological systems: think buildings which 'eat dirt' and neutralise pollution, construction materials which heal their own fabric, and self-adapting structures. The algaeponics unit will be the first one of its kind to be permanently installed in the UK. Its research potentials are myriad, but one possibility is in the production of biomass and sustainable-fuel solutions. (To underline this future focus, Armstrong and Spiller are part of Project Persephone, based at Greenwich University, which involves designing a living environment for an interstellar craft to be deployed within the next 100 years.) This is really groundbreaking stuff, which will impact not only on this school in its training of future architects, but inevitably on our broader understanding of building technologies and what we can expect from the behaviour of our built environment -- science futures, rather than science fiction. The site's World Heritage designation demanded huge sensitivity, particularly for a building of this scale and volume. Heneghan Peng's design performs a deft trick, achieving a distinct, modern profile while being remarkably unobtrusive. Its gestures towards context are largely articulated in its proportion and facade, particularly the arrangement of windows. 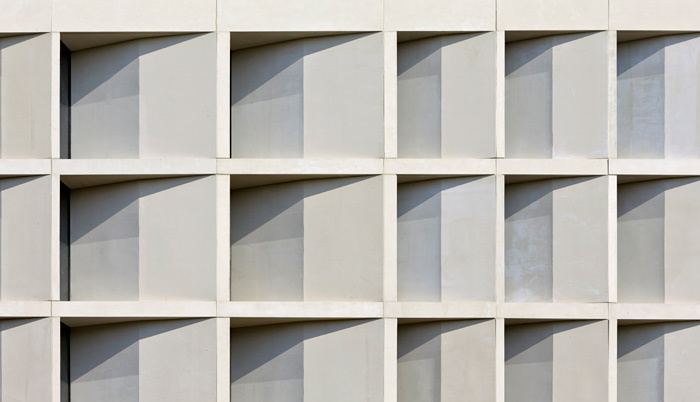 The oversize windows on Stockwell Street, and repetitive, angled slots on the perpendicular facade, mimic the busy variations found in the finer, historic texture. Although clad in stone, the new building is decidedly and -- given its ambitions -- fittingly contemporary. 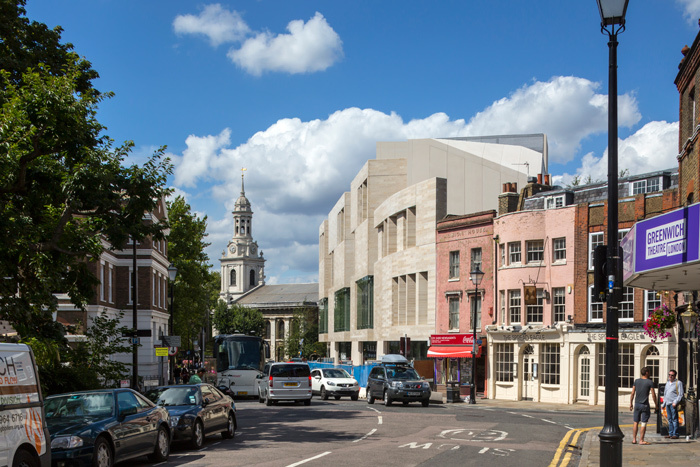 The architects specified a honed Bavarian Jura stone rather than the traditional Portland, used nearby in both Wren's Old Royal Naval College -- the centrepiece of Maritime Greenwich -- and Hawksmoor's Parish Church of St Alfege, just to the immediate north west of the site. It is the right move: the dusky Jura settles into the site elegantly, less obvious and dazzling than good old Portland and with a finer, smoother finish, more suited to the logic of the modern design. The stonework itself suggests an elegant masonry pattern, while the very slightly pinkish tone warms up to the red brick, London stock and weathered pilasters of the surrounding buildings. Greenwich's historical significance predates the arrival of William the Conqueror to British shores. This provenance means there is an abundance of historic documentation. Maps and surveys show small streets and commercial frontages arrayed round the curve of Stockwell Street. These individual, radial lines are felt primarily in the fenestration of the new building, which cuts at juddering angles to the disciplined strips of the site's plan geometry. 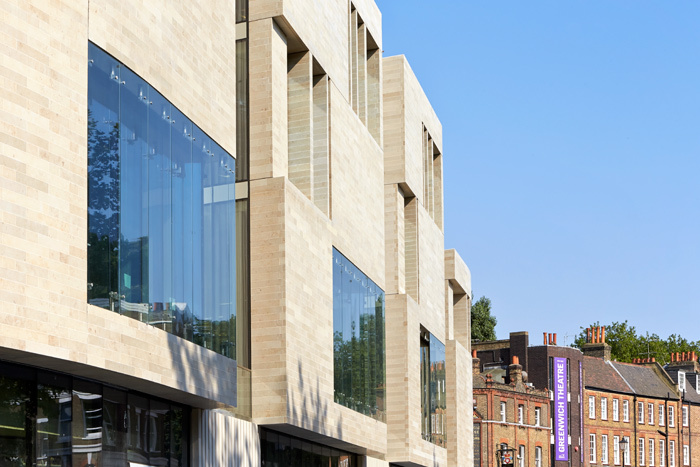 With only rhythm articulating its facade, the approach to the university sees the new building step back off the curb, deferring to the Tuscan colonnade and arch-interrupted pediment of Hawksmoor's St Alfege. Heneghan Peng's building then veers dynamically around the corner of Stockwell Street, where the entrance to the campus library is located. This September will mark the first entrance of students, staff and public to the fully functional library, as well as to the adjacent academic building, housing the architecture department and also intended for various design programmes. At the time of Blueprint's visit in late summer, there was still some work progressing on site, as construction drew to a close while fit-out proceeded apace. The raw effect of the building is palpable, even before the clean-up begins in earnest. The installation of interior elements, such as the solid-steel reception desk -- made of welded and folded metal of such weight that a truck had to be specially adapted in order to transport it -- had already started to give a flavour of how the vast spaces will feel when occupied. 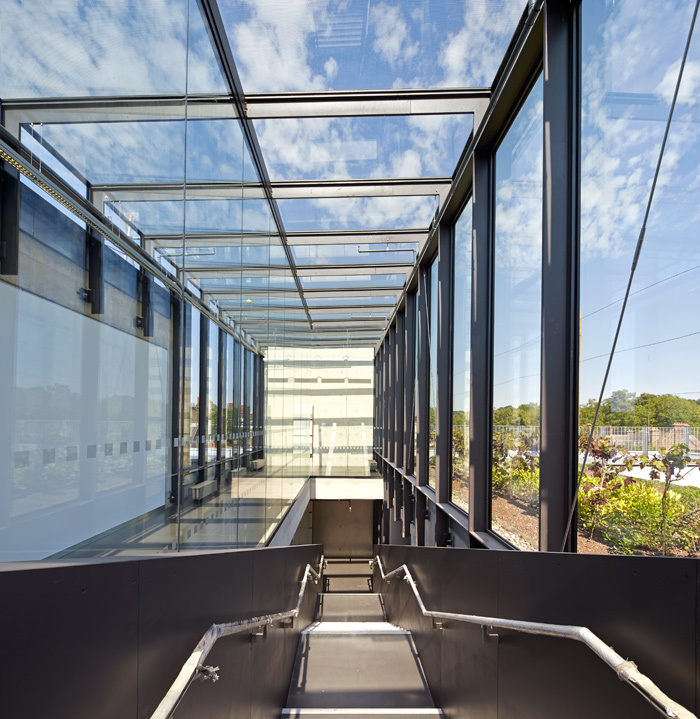 Miles of exposed concrete soffit, bearing services and electricals, indicate work areas where students might cluster, while extra-wide corridors and glazed thoroughfares suggest spaces for exchange and observation. A trim, cast-concrete staircase, painted in a slaty blue-grey, blazes sharply through the building's main atrium. In an enduring and recurrent attention to detail, Heneghan Peng specified a specialist paint from Germany, normally used to weatherproof trains. This slightly metallic shade differentiates subtly, but decisively, from the pale concrete surrounds, drawing the eye up into a light-filled stairwell around which, in place of balcony railings, metal floor-grids have been attached end-on to give a stylish and pleasing texture without compromising any of the unembellished, factory feel. Although 'raw' and honest, the interior of the building is far from brutal in the sense of crude roughness. The precise vision proposed by Heneghan Peng required a fastidious attention to detail. The fine concrete used for the entire internal structure will remain unrendered, but it is buttery-smooth and, furthermore, it will weather under heavy use to a beautiful sheen. And those miles of exposed soffit are arranged to echo the logical linearity of the 'finger' blocks. Concrete movement joints between the structure and glazing in the courtyards, and perfectly finished steel-framed sidings are on display, in a manner that seems almost instructive to students of architecture. Was this on purpose? Heneghan confesses that any appearance of making the building instructional was happily coincident with the avoidance of nasty boxed-in finishes and the making of cost-saving decisions. In the architecture building, Heneghan Peng's sectional logic was clear in its rigid division: the ground floor for public activities, the first floor given entirely to open-plan studios, seminar rooms above the studios, and finally, administrative offices at the very top, as well as access to the study gardens and landscaped roof. 'We weren't used to the idea that in London, students don't always have a fixed desk,' says Heneghan. The design, therefore, is extremely generous with studio space, allowing for maximum flexibility in the ways that different departments occupy and interact with it. The floor can either be left entirely open, so that all users can observe activities in other parts of the studio, or half-height partition walls can be positioned, to create intimate corrals. White plasterboards for pinning up and displaying work are attached to the smooth, bare concrete walls, but these too can be demounted according to requirements. 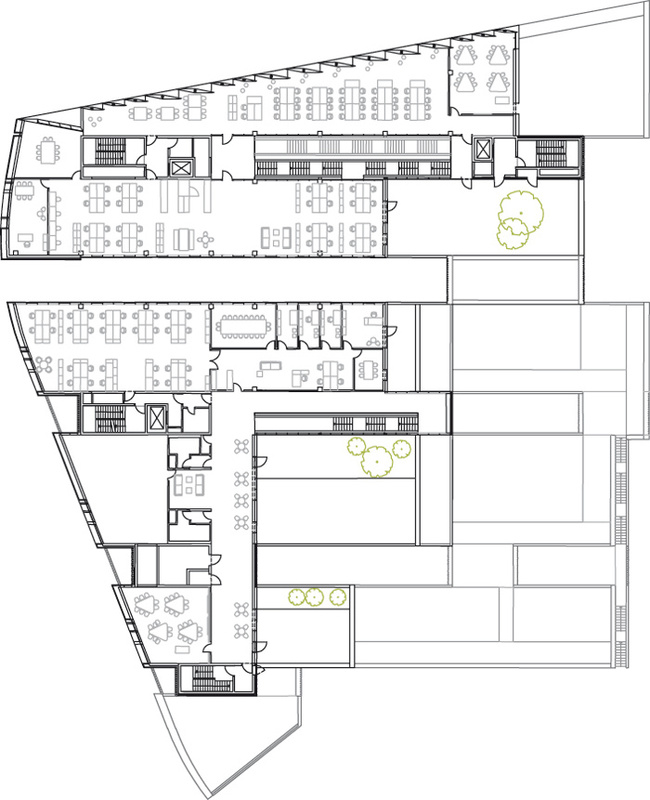 This flexibility of space and use is hinted at elsewhere: the wide corridors offer themselves as promenade galleries, while fully kitted-out film, animation and TV studios suggest that the building could be used commercially and creatively both by those inside and outside of the academy. One of the most impressive -- even daunting -- spaces for anyone who has trained in architecture or the creative arts is the 'crit pit'. 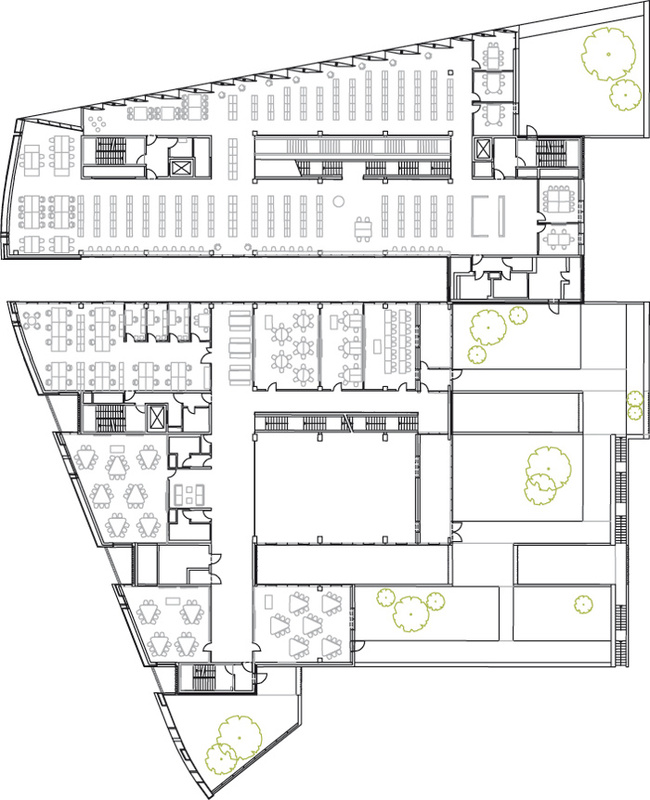 A large, double-height space in the middle of the studio floor is dedicated to the often-dreaded studio crit or pin up, where students present their work for judgement to an audience of peers and tutors. In Heneghan Peng's design, the formal theatre of the crit separates itself from the studio floor via a drop in the floor level of about 30cm, neatly avoiding any possibility of desk-creep and preserving the sanctity of a space for debate and critique. Yet, the 'crit pit' remains open on all sides to the activities of the studio floor. Student presentations will also be visible from glazed balconies and walkways above the studio level and to students of other disciplines, allowing an open intellectual cross-fertilisation. The exposure to snatches of conversations, nascent ideas and flashes of design logic is immensely stimulating for students, as well as serving to galvanise a school culture. Thus, the dramatic space of the 'crit pit' also becomes a space for celebrating the attainment of a level of work worth presenting. The 'crit pit' will also lend itself, along with the two traditionally ramped auditoria, to public events, performances and talks; one event has already taken up the eternal question of the architect's role. Home to the Prime Meridian line, from which all time zones are measured, Greenwich has on many occasions been the focus of collective expectation -- particularly around the turn of this century. The (initial) disappointment of the Dome, persistent grumbles around Erskine's unshiny, unhappy Greenwich Millennium Village, and more recently, the Carbuncle Cup awarded to Grimshaw's refurbishment of the Cutty Sark, may have somewhat blighted the borough's architectural name. One structure, however, which gave way to the new University of Greenwich building -- the demolished John Humphries House -- may better reflect the area's spirit. In an uncanny premonition of professor Spiller's technological leanings, John Humphries House, a nondescript little modern monolith, was home to the London Boroughs' Joint Computer Committee and its highly advanced LEO III computer -- in the Sixties, the 'white heat' of technology. Six neighbouring London councils pooled their data-processing requirements here and revolutionised their payroll, accounting, electoral registers and library catalogues. Later, the building housed a planning department, which gave way to numerous small businesses and independent artists' studios as well as a hugely popular local weekend market. Although that unremarkable block is now physically erased, its convergence of ground-breaking technology advances with the broader remit of local and cooperative civic engagement neatly match the university's agenda. These are traits that will hopefully permeate Heneghan Peng's new and infinitely more impressive building, as well as the work of its future generations of architects.